Even as smartphones and tablets become thinner and lighter, the newest models seem to pack more and more capability into less and less space. For test engineers, ever-greater integration often means testing more functions per device through fewer and fewer access points. Although there are fewer physical test points, connecting the device to a test instrument still requires some combination of cables, probes and test fixtures, all of which introduce errors. Fortunately, the calibration capabilities built into a vector network analyzer (VNA) remove these errors and provide greater measurement accuracy. 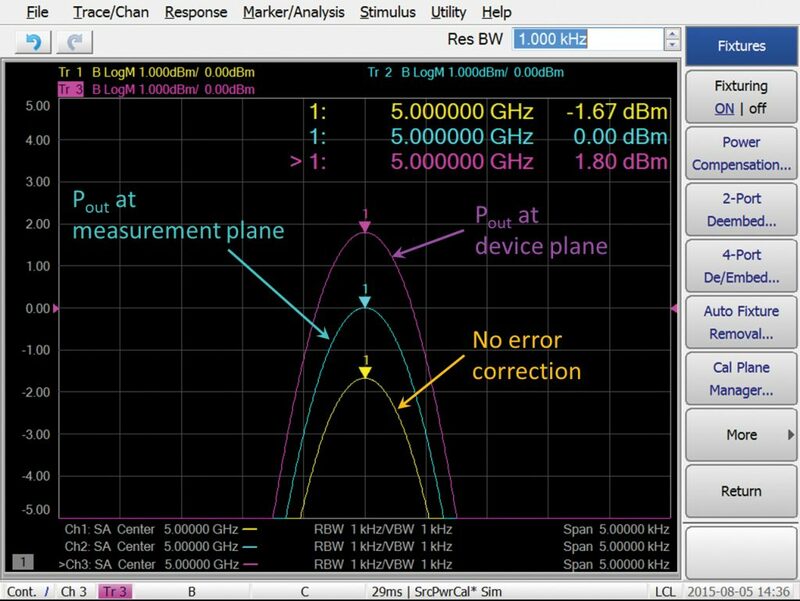 In a VNA, error correction applies to measurements such as S-parameters and gain compression. Now, when using a high-performance VNA equipped with built-in spectrum analysis (SA) capability, error correction also applies to spectral measurements such as distortion that are made along internal signal paths (Figure 1). As a frame of reference, consider a device under test (DUT) with a set of test requirements that include network and spectrum measurements. When making either type of measurement, the DUT is connected to one type of instrument and then disconnected before being connected to the other. Focusing on the VNA, input and output cables are present between the DUT and the analyzer, and in some cases the DUT will be mounted on a test fixture. Earlier in the development process, the DUT may still be on-wafer and connecting to the VNA requires probes and cables. Every element between the VNA output, DUT input, DUT output and VNA input introduces some kind of electrical error that may be difficult or time-consuming to remove. As a practical matter, the need to connect, disconnect and reconnect the DUT to the VNA or SA will soon become inconvenient and time-consuming. During each connection activity, there is also the possibility of damaging the DUT. A majority of component measurements are performed using a VNA. The built-in calibration capabilities provide greater measurement accuracy by removing the instrument’s systematic errors and any cable effects. These corrections apply to measurements of S-parameters, gain compression, noise figure, and more. Using a VNA that includes built-in SA functionality has three additional benefits. First, it simplifies DUT connections because the VNA and SA measurements share the same test ports, eliminating the need for manual setup changes or external switch matrices. Third, SA results gain the advantages of calibration and enhanced accuracy in measurements such as distortion, signal-to-noise ratio and nonharmonic spurious signals. It can be difficult to achieve accurate results during in-fixture and on-wafer testing because each configuration introduces a number of potential errors. For the first time, calibrated spectrum measurements can be made in these scenarios, and the VNA’s built-in correction capabilities overcome the errors caused by cables, fixtures and wafer probes. When making spectrum measurements with a VNA, the calibration steps are the same: calibrate source power, calibrate all receivers, and remove the effects of the test-port cables. A calibration kit and a power sensor are used to detect and correct the measured errors. For in-fixture SA measurements, the best approach is to use an optional automatic fixture removal (AFR) capability to characterize the fixture. Once that has been done, the next steps are to perform a calibration at the ends of the coaxial test cables and then use the VNA’s built-in de-embedding function to remove the fixture effects. This extends the calibration plane beyond the measurement plane to the device plane (Figure 2). With on-wafer measurements, two approaches are available: use de-embedding, or use a specialized calibration kit called an impedance standard substrate (ISS). De-embedding removes the effects of the probes and the process is the same as that described above for an in-fixture measurement. The process is different with the ISS on-wafer calibration kit. Step 1 is performing a source-power and reference-receiver calibration; a power sensor is connected to the end of the test-port cable and then a coaxial calibration kit is connected. The ISS is used to perform a calibration at the end of the wafer probe. These steps move the source and receiver calibration plane to the tip of the wafer probes, ensuring highly accurate on-wafer spectrum measurements. A closer look at an actual spectrum measurement illustrates the potential for improvement in measurement accuracy. In Figure 3, the yellow trace is the measurement result without the benefit of VNA calibration. Source power is corrected but no receiver correction has been applied. This is similar to the results provided by a stand-alone spectrum analyzer without cable compensation. The blue trace is the output power (Pout) at the measurement plane after VNA calibration. Although a stand-alone spectrum analyzer can compensate for cable effects by removing the “loss per gigahertz,” this is not as accurate as a VNA calibration, which removes the full frequency response of the test-port cables. In this case, the measured magnitude is 1.67 dB different from the yellow trace. The purple trace is Pout at the device plane after de-embedding. This includes additional error correction with removal of fixture effects from both the input source power and the various output power measurements. Its magnitude is 3.47 dB different from the yellow trace and 1.80 dB greater than the blue trace. This is a significant level of difference that may be enough to cause false pass or fail results during limit testing. The level of improvement illustrated above goes beyond what is possible with a typical spectrum analyzer. It’s enabled by applying the strengths of the VNA. Determining the actual accuracy requires a close look at several factors. These include actual specifications for the VNA and the power sensor, and it also includes a specification called SA detector accuracy. In simplified form, the estimated accuracy at 26.5 GHz looks like this: VNA uncertainty is ±0.15 dB; power sensor accuracy is ±0.10 dB; and SA detector accuracy is ±0.16 dB. Thus, the worst-case value is ±0.41 dB, which comes from the sum of the three absolute values (e.g., 0.15 + 0.10 + 0.16). In reality, the accuracy is most likely within ±0.24 dB when estimated using the residual sum of squares (RSS) technique. This accuracy is estimated at the DUT ports after using calibration and de-embedding to account for all cable, fixture and probe effects. This is quite impressive when compared to stand-alone SAs that generally offer accuracy of ±2.0 to ±2.5 dB at 26.5 GHz, specified at the analyzer’s test port. This detail is important: with SA capability in a VNA, accuracy is 10x better and the reference point is at the DUT port, not at the analyzer’s test port. 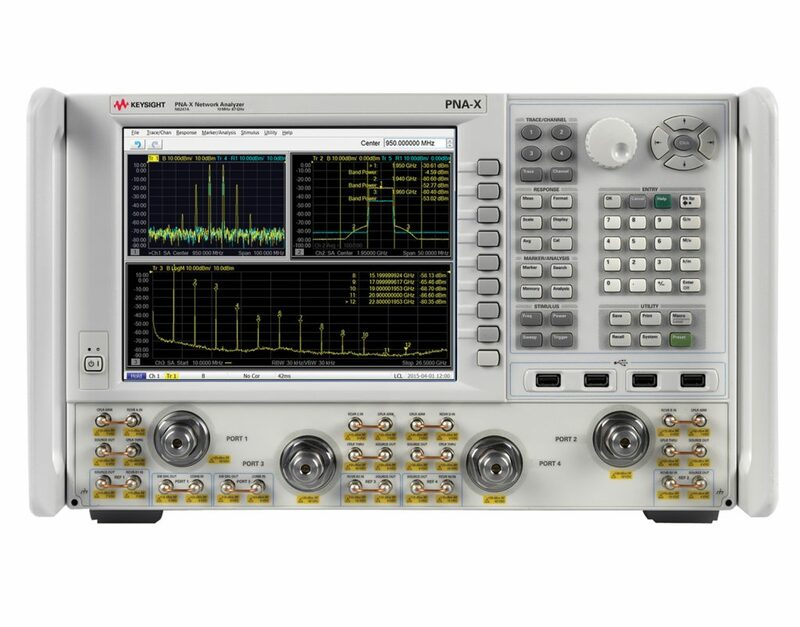 Adding high-performance spectrum analysis capability to an advanced VNA brings new levels of speed, convenience and insight to component testing. The ability to apply the VNA’s built-in correction capabilities also enables new levels of accuracy, especially when connecting devices to the system through fixtures and wafer probes. On the production line, the increased accuracy in spectrum analysis can translate into narrower test-limit guard bands, and these reduce the likelihood of false pass or false fail results. Ultimately, this helps maximize the DUT’s performance specifications—and this can be a significant competitive advantage in today’s marketplace. For additional information, please visit www.keysight.com/find/PNA-SA.